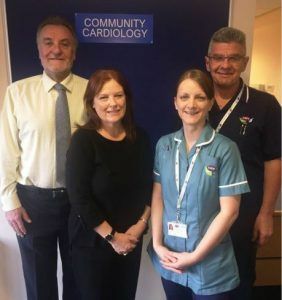 The Care Plus Group Community Cardiology Service is based in the community at Weelsby View (Ladysmith Road) for four days of the week and Immingham (Roxton practice) on Mondays. Prior to this service being launched in 2017, patients being treated for heart conditions only had the option of treatment in hospital. By bringing a team of specialist cardiology healthcare experts into the community, some of these patients are now able to receive expert diagnosis, care and advice in the community. The thought behind the service is that many patients that are seen (and indeed continue to be followed-up) in secondary care could more appropriately be seen and dealt with in primary care if the necessary facilities, expertise and confidence was present in the primary care setting. The service is not meant to be a replication of local secondary care cardiac outpatients but more a complementary service where patients, in whom there is a low expectation that more extensive and invasive investigations are necessary, can be seen hopefully in a more responsive way with greater scope for greater continuity of care. 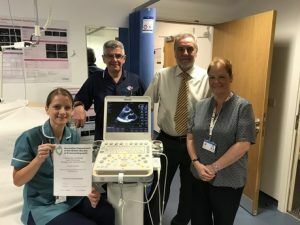 The Community Cardiology Service has been awarded the British Society of Echocardiography Departmental Accreditation, which is a much sought-after benchmark of quality. The heart failure service will run as per NICE guidelines. Patients with a high probability of heart failure (symptoms, previous heart attack/ECG abnormalities) will be seen at a ‘one stop clinic’ where they will have an echocardiogram, see the Consultant Cardiologist and Specialist Heart Failure Nurse at one visit with a maximum two week wait. Patients with possible/suspected heart failure (symptoms and raised BNP) but without high risk features would similarly have a one stop clinic appointment but with a maximum six week wait. We are offering an open access echocardiography service at both sites. This is for patients in whom echocardiography is felt to be valuable to define possible underlying conditions such as cardiomyopathy, hypertensive heart disease, possible LV dysfunction or to evaluate the importance or otherwise of a heart murmur. Patients with AF can be very straightforward or remarkably difficult for any number of reasons. If it is felt that a patient might benefit from a specialist opinion to help with decisions regards rate/rhythm control, anticoagulation or defining whether the AF is secondary to any underlying condition then referral to the community service would be welcome. Referral of general cardiology patients for advice is also welcome. Clearly if it is felt that a patient is likely to need extensive or invasive investigations more appropriate to secondary care then that referral route would be more appropriate. The team aims to be a resource to primary care generally and is committed to delivering educational support to practices whether that be to GP’s, practice nurses, junior doctors, the rapid response team, palliative care or indeed anyone else who feels we may be able to help them in their clinical practice or educational needs.